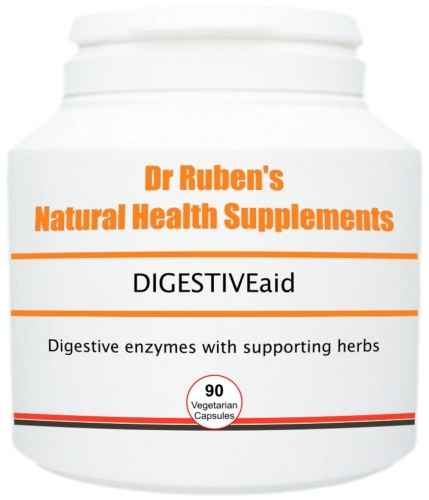 DIGESTIVEaid provides a broad spectrum range of plant-derived digestive enzymes to help maintain efficient digestive function and a healthy intestinal system. It contains herbs that are well-known for their food digesting actions. Ginger and peppermint, in particular, may help to soothe the gut lining. **Recommended by Marie Claire magazine and world-renowned naturopath and author, Max Tomlinson, for bloating and poor digestion. Click on the image above (beneath the product image) to view the full article. An enzyme is a substance produced in the body, which acts as a catalyst to trigger a particular chemical change in another substance. Complex substances are broken down in this way into simple compounds to facilitate assimilation and absorption, as in the case of digestive juices. The human body makes more than 3,000 kinds of enzymes, which help to speed up chemical reactions and save energy. Digestive enzymes, which are only a few of the thousands of known enzymes, are complex proteins that are found in the digestive tract. As mentioned above, they stimulate chemical changes in other substances and are used by the body to break down food into nutrients (which are then digested) and waste (which is then expelled). The human body produces around 22 different types of digestive enzymes, each of which acts on a different type of food. Without digestive enzymes, we could not exist. Our body's reactions would be too slow for life to be possible, because they are involved in almost everything that happens in the body. Unfortunately, the number of digestive enzymes produced by our bodies decreases as we age - enzyme production in the body decreases by 30% in most adults over 50! Caffeine, alcohol, illness, pregnancy, stress, severe weather and exercise can also all take their toll on our enzyme reserves. Digestive enzymes work optimally at a specific temperature and pH. They are secreted by different glands in the body, including the salivary glands, the stomach and pancreas glands and the glands in the small intestines. They also each have specific sites of action, including the mouth, the stomach, the duodenum and the jejunum. When we don't produce enough digestive enzymes to complete the process of digestion efficiently - gas, bloating, and more serious health issues may occur. As well as being produced by the body, digestive enzymes are found naturally in fruits, vegetables and other raw foods. The digestive enzymes in DIGESTIVEaid are derived from high quality plant sources. Find out why digestive enzymes and plant enzymes are an essential element of healthy digestion! Take 1 - 3 capsules before each main meal. If taken alone (i.e. rather than in combination with our other digestive supplements ), start off on a higher intake of 2 - 3 capsules before breakfast, lunch and the evening meal for 3 - 4 weeks. Thereafter, reduce to 1 - 2 capsules, 2 - 3 times per day or as required.